I'm floored by the technology of the Switch, and the versatility of the console is second to none. It really is a home console that you can take anywhere. I've seen situations where home consoles can be transported, and it's like a big over-the-shoulder carry-on bag, but the versatility of this thing is groundbreaking. When you undock the Switch from its home console and go into handheld, the controller feels the same, it is the same, and it reacts the same. The screen on the undocked handheld system is big enough to be its own world, but small enough to carry anywhere. I was in this confined living room space where you got lost in the game 'cause I'm playing on this 60-inch TV, and then you undock and continue to play the game. They had this molecular glass, which dropped and revealed I was in the middle of the desert. I never once knew the change in environment. It's truly, truly tremendous. In typical Nintendo fashion, I was playing Legend of Zelda: Breath of the Wild. Now I haven't played Legend of Zelda since the gold cartridge eight-bit versions, so I just needed to pick up and start going, and I did. 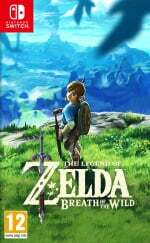 The go-anywhere aspect of the game is incredible, and I know for fans of the Zelda franchise, they're going to flip. I know for fans of Nintendo, they're going to go crazy. Everyone is speculating about how good the game actually is—it's going to exceed expectations and, for a dude like me, a 40-year-old [in April] who hasn't played Zelda since the gold cartridge, I sat down and was hooked. In a matter of 30 minutes I didn't want to put it down. While we could write off some of the enthusiasm of this celebrity endorsement as Cena is 'on the payroll' from promotional work, but he does seem to have a good working knowledge of NES games (in the rest of the original interview) and indeed Zelda's gold cartridge. If the Nintendo Switch can win over the leagues of old-school Nintendo fans, it could certainly be a big success. Factoid: John Cena used to wear Nintendo wristbands before he started selling his own. See his match against Big Show at Wrestlemania 20. @fiben1002 You'll have to excuse me as my knowledge in John Cena is missing. What on earth is the invisible joke about? "They paid me a lot. @Grandpa_Pixel One of Cena's catchphrases is "You can't see me." @Grandpa_Pixel A repeating phrase in John Cena's theme song is "You can't see me." I won't believe Cena is really hooked on Zelda unless his body looks like mine by the end of the year. so weird seeing him in jeans that go all the way down instead of jorts level. @JaxonH Now would be a good time to hear that the next WWE 2K game will be coming to the Switch also then. @QBertFarnsworth just buy the inevitable line of workout weights for joycons by john cena. "ARE YOU SURE ABOUT THAT?!" It looks like he's about to crush that poor controller in his big ol hands haha. Never watched wrestling but I really like John Cena. Always seems like a real down to earth kind of dude. You mean that someone Nintendo is paying thinks that their products are good? Quelle surprise. He was "floored" by the Switch, but he kicked out. Why do I see a picture of an empty couch? @QBertFarnsworth Y'know, it's possible to do both, right? The Switch's technology is so advanced that its controller's floating by its own. Forget 2k17 we want wrestlemania and no mercy on vc! About as likely as a john cena heel turn but we can dream. If what he said is 100% legit then the Switch will be possibly remember as the console to launch with a 10/10 game and the best in a franchise. This is better than releasing with 30 plus ok to mediocre titles. @onex My son is a gigantic wrestling fan, and my kids watch a lot of kids TV shows in which Cena is promoting things. I think it's possible to be an adult and only have a passing knowledge of who he is. I think every kid knows who he is. Cena is a great spokesperson for Nintendo to get. I just know that with Cena's wrestling schedule, travel schedule, movie/TV show schedule, workout schedule, and with all the charity work he does, he's not going get addicted to Zelda like I will. In fairness, it would probably take Cena 10 years of Zelda addiction to achieve my level of Dad-bod. I am waiting for Roman Reigns to endorse before I purchase. 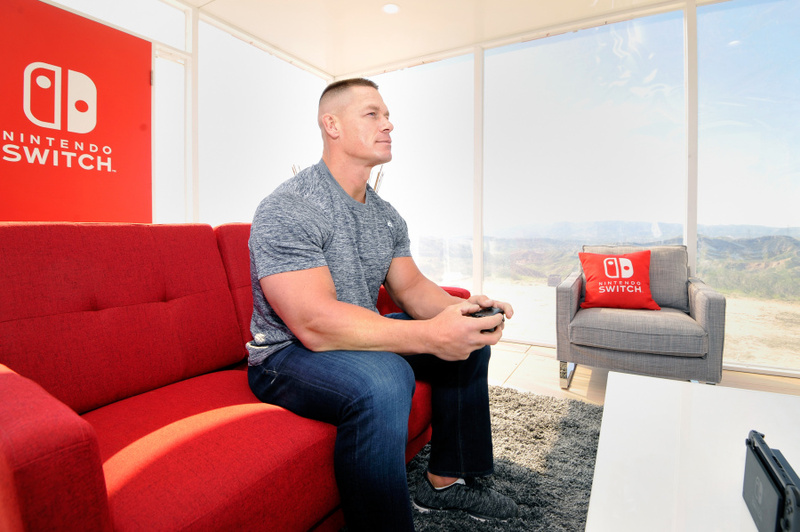 The Switch controllers must be really durable to withstand John Cena's massive arms and hands. Oh. Is that who John Cena is? I didn't know he was a wrestler. I'm not at all a fan of WWE, but Mr. Cena is the bomb. Such a cool dude. Nothing against Cena, who is just a popular paid marketing tool in regards to the Switch imo, I choose to purchase a Switch system long before it was even called Switch (NX). It's a cool way to market the Switch to wwe fans, and a good trade off for wwe to air the Switch commercial every Monday night raw since the first Monday after the Super Bowl. So I'm not hating the strategy. Nintendo has turned up their marketing strategy to the fullest. We will see how the rest of the year pans out for the Switch success. "When you undock the Switch from its home console and go into handheld, the controller feels the same, it is the same"
Factually untrue. The way the JoyCons feel in your hands when attached to the console itself is vastly different than when attached to the Grip. The Grip offers the extra handles, for instance. Makes accessing the right analog stick way less of a chore. I think he's on point here, for anyone who took the time reading his statements he understands the relevance of this console versus what's been available. There's no question he enjoyed Zelda, anyone would. Particularly when it comes with a paid gig, and you get to chill on a couch and play games! @gatorboi352 not "untrue", simply his opinion likely after spending some time with the system. @Yamuse is going to say "Of course Nintendo had to have John Cena say this to get people to buy the system. It is still going to sell worse than Wii U." Cena is too busy to play games. I wish someone would pay me for praising games. @HeelGanon But, then everybody will boo it. @Haywired how do you embed? put [im g] before the url and [/im g] after it. But without the spaces. Well if you want to take the Switch to a friend's home and use it at their TV, you'll still need that 'big over-the-shoulder carry-on bag'. In that regard, the Switch isn't any more compact than the Wii U. And btw, I've traveled a lot with my Wii U in my backpack (which actually isn't that big). Not only doesn't it take up that much space, it also still functions perfectly. And the fact that he has only played the first and second game, seems to appeal to even those kind of people, since IIRC, they tried to base on zelda 1 for this game, and if they appealed to someone who has only played the first (and second one), they seem they did a good job. Seriously cannot wait for this game. Really hope my Special Edition from Amazon ships in time to play at launch. Or that the very least, early next week. So Nintendo is working with WWE on promoting the Switch similar to how Microsoft worked with WWE to promote the original X-BOX? What are the chances of the next WWE 2K game coming to Switch, then? There better be some new wave of WWE wrestling games for the Nintendo Switch and it better not be a lame 2K games like the PC, PS4, and Xbox 360. Something similar to WWF No Mercy! for N64 or WWE Day of Reckoning for GameCube but with modern roster and legends would be awesome. Now they just need to get "The New Day" going on this too. AWWWW NINTENDO! DON'T YOU DARE BE SOUR! SWITCH, FOR YOUR LONGEST REIGNING TAG CHAMPS, AND FEEEEELLL THE POWAAAAAA!! @NIN10DOXD He would break Smash in half. He would turn Smash 4 into Cena only, no items, Final Destination! @abbyhitter On the outside, they're holding up. But on the inside? @QBertFarnsworth Lol I was only referring to bodybuilding(powerbuilding in my case) and video games. I'm an avid practitioner of both. That's not how you hold it fellas. @fiben1002 Perfect first comment, ha ha.